Harold A. Burnham is an 11th generation wooden-boat builder whose ancestors arrived in Essex, Massachusetts, in 1635. Harold uses his skills as a logger, sawyer, loftsman, shipwright, mechanic, plumber, electrician, spar maker, sail maker, and rigger to build his boats, however, it is his skill as a mariner that make his boats uniquely effective. He uses hand tools familiar to an 1800s shipwright, works out-of-doors through the winter, and launches vessels the old way using wedges, grease, and gravity. The 65-foot Thomas E. Lannon has become a landmark on the Gloucester Harbor as a passenger-carrying charter schooner. 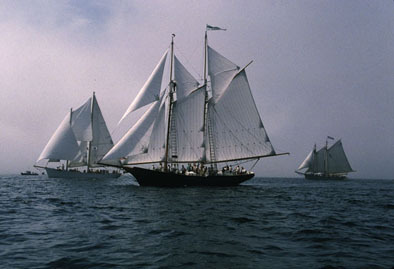 She is seen here (middle) during the Gloucester Schooner Races. When Harold Burnham constructed the Lannon, commissioned by Tom Ellis, she was the first sawn-frame, trunnel-fastened vessel built along the Essex riverbank in nearly fifty years. "The boat that he built is strong," says Dana Story, an elder shipwright in Essex. "He did things that we did't do in the old shipyard - like put mortise-and-tenon joints on the forward cant frames. A stern is not an easy thing to build; building an oval transom is the thing that separates the men from the boys." Burnham has essentially revived a once dormant shipbuilding technique. In doing so, he has reconnected a town to its own shipbuilding heritage. To read a week-by-week diary of how Harold built the Schooner Isabella, visit the Essex Shipbuiliding Museum. In 2001 and 2010, Harold A. Burnham was awarded an MCC Artist Fellowship in the Traditional Arts. And in 2012, Burnham was named a National Heritage Fellow, the highest honor in folk and traditional arts this country awards.